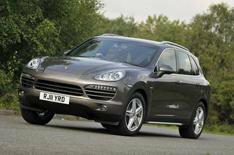 Porsche Cayenne Diesel review | What Car? What is it? The Cayenne 4x4 gets an updated diesel engine that's more powerful and more fuel- and tax efficient than the engine it replaces. The 3.0-litre V6 now has 242bhp an increase of just 5bhp. Performance gains are equally modest it's 0.2 seconds faster from 0-62mph and top speed has increased 2mph to 137mph. There are small improvements to its emissions and fuel economy, as well. It averages 39.2mpg (up from 38.2mpg) and CO2 emissions have dropped 6g to 189g/km, which means the Cayenne diesel now sits two tax bands lower, shaving around 20 off the monthly company car tax bill for a top-rate tax payer. It's not all good news, though, because of an increase in list price of over 1000. What's it like to drive? A lot of fun. Our test model had the optional adjustable air suspension, which makes for a firm low-speed ride even in the softest setting, but things settle down at speed and the Cayenne is also extremely agile for such a big car. The diesel pulls strongly and smoothly and engine noise is only ever an issue when accelerating hard. Even then it's fun rather than intrusive. Okay, the diesel is never going to sound as sweet as the 4.8-litre V8 petrol, but for 10,000 less you get a car that's just as imposing, good to drive and a lot more fuel efficient. That makes it our favourite Cayenne. What's it like inside? It's easy to get confused by the array of switches, buttons and dials on the dash and centre console, but you can't fault the quality of the fit and finish. Some rivals have seven seats, but the Cayenne is for five only and even then the middle rear seat will be for occasional use only. Should I buy one? No one can do the sporty premium 4x4 quite like Porsche. BMW has the X5, which is more practical, and the X6, which is sleeker, but while they are similarly priced, the BMWs are more mainstream, which could put off some buyers. The Range Rover Sport has the prestige and the presence but the Porsche has it whipped on running costs. At this end of the market your heart can easily rule your head but the Porsche Cayenne diesel should be able to satisfy both.